All is ready for Advent! As Most of you will know from my earlier email, my dad passed away on Tuesday. 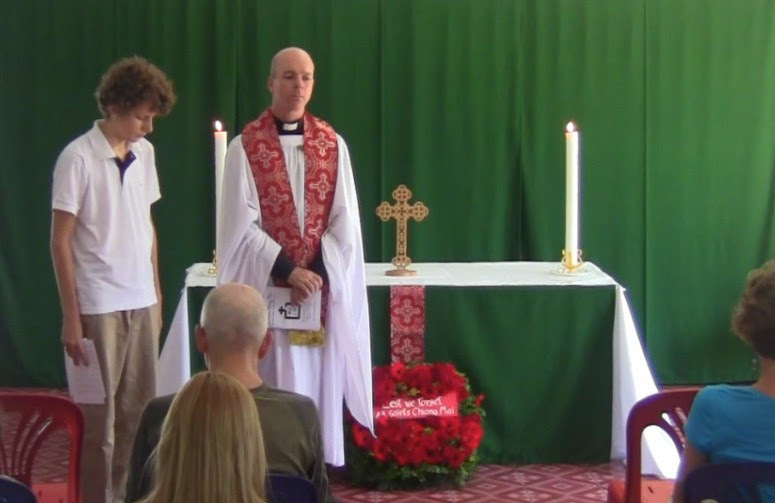 This is a very sad time for my family and me, and I would greatly value your prayers – especially for my mum. The good thing is that we know that he is at peace with God. 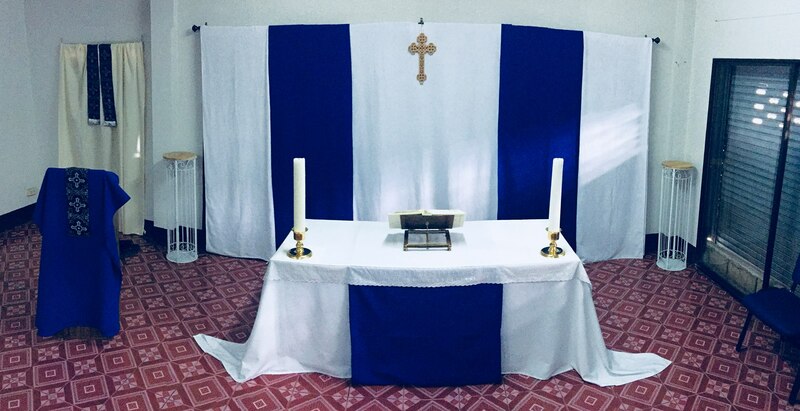 Meanwhile, life and worship continues at All Saints, and I would like to thank the great work of Gene, Taylor, and Mark, in leading last Sunday’s service, and all the others who have so amazingly swung into action! I will be back before Christmas, and look forward to once again celebrating the coming of the Prince of Peace with you all. This week’s service will be followed by a potluck and decorating the church of the church for Christmas. I am sure it will be a great time and I wish I could be with you. 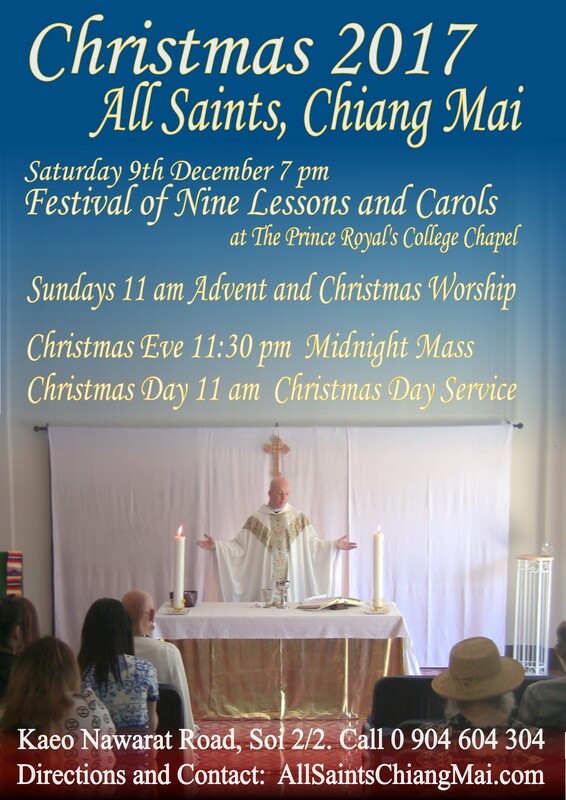 Then on Saturday 9th, we will have our annual Festival of Nine Lessons and Carols in the Prince Royal’s College Chapel. This should be a very special event! Please take tickets to sell and invite your friends. Thanks to Chris, Tarntip, the Chase family, and so many others, for taking over the organisation of this event! Our readings for this Advent Sunday are Isaiah 64:1-9, 1 Corinthians 1:3-9, Mark 13:24-37, and Mark will be preaching this week. The hymns are O Come, O come Emmanuel, and Come, Thou Long Expected Jesus. 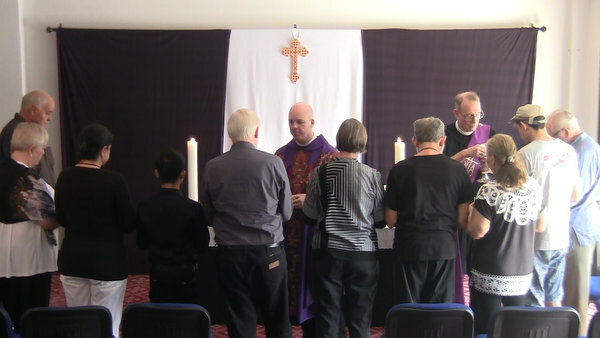 The readings can be found via this link ! 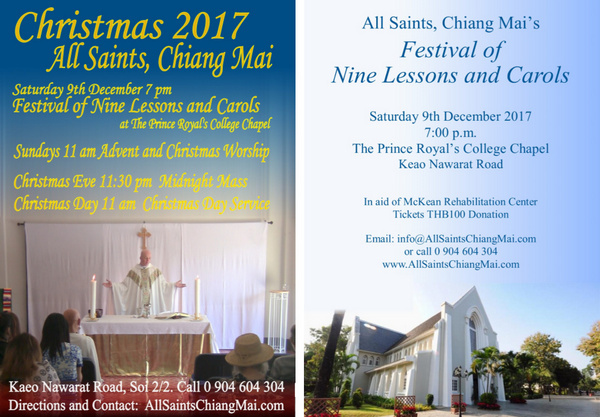 The two posters shown below are now available for distribution at the back of the church. Please take them. We particularly need to make sure that a Christmas 2017 poster is in every Rimping supermarket. They need to be handed in at the information desks before 15th December for display for the next two weeks. 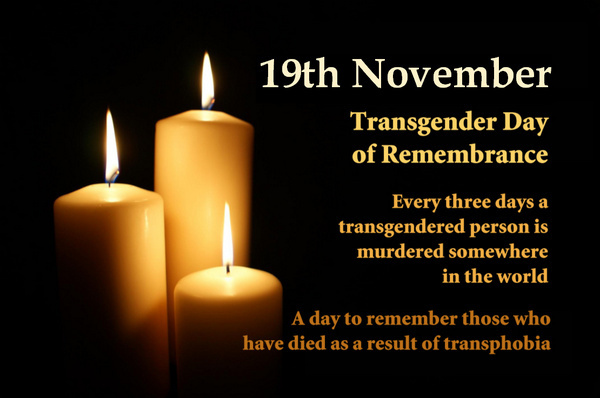 This week we come to the end of our Season of Remembrance as we mark the Transgender Day of Remembrance. 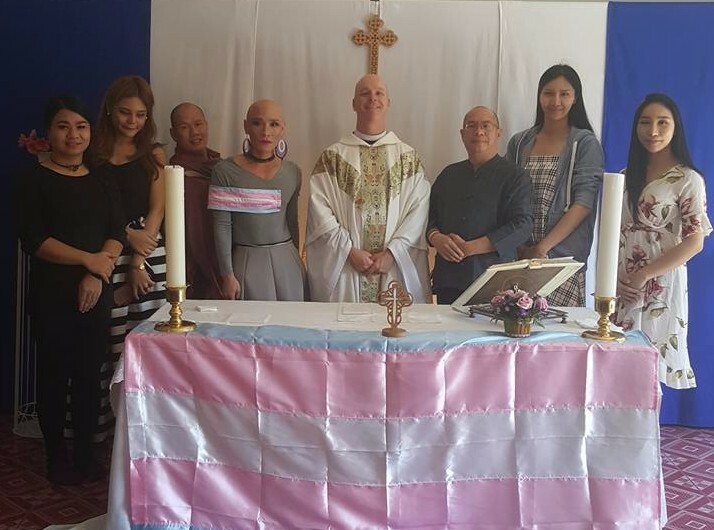 The official day is 20th November, but we will be using our service this Sunday to remember those who have been killed, or are discriminated against, due to their gender identity or expression. As Christians, we believe that all people are made in the image of God and we are committed to reaching out in love to all God’s children. We will be joined by some people from M-Plus as we worship together. Our readings for this Sunday are Isaiah 56:1-8, Acts 8:26-40, and Matthew 19:3-13, and we will be singing the hymns Song of Mary, Stand up stand up for Jesus, Beauty for Brokenness, and Let Us Build a House! Christmas is coming soon! In two weeks’ time we will be celebrating Advent Sunday as we decorate the church. Put this important event in your diary! This week we will celebrate All Saints’ Day at All Saints. It is a time to remember all those who have gone before us, both saints and sinners, and to think of loved ones passed. It is also a time to think about the future of our church, All Saints, and we will be collecting the pledge cards which people have taken over the last few weeks. Finally, this year marks the 500th anniversary of that All Saints’ Day in 1517, when Martin Luther nailed his 95 thesis to the door of the church in Wittenberg. That event is taken as the beginning of the Reformation, and we might not be worshipping in English today has not that mighty movement not occurred. Our service this week will be followed by a potluck as we celebrate All Saints’ Day and that 500th anniversary! Our readings for this Sunday are Revelation 7:9-17, 1 John 3:1-3, and Matthew 5:1-12, and we will be singing the hymns For All the Saints, Sing With All the Saints in Glory, The saints of God! their conflict past, A Mighty Fortress, and O When the Saints! 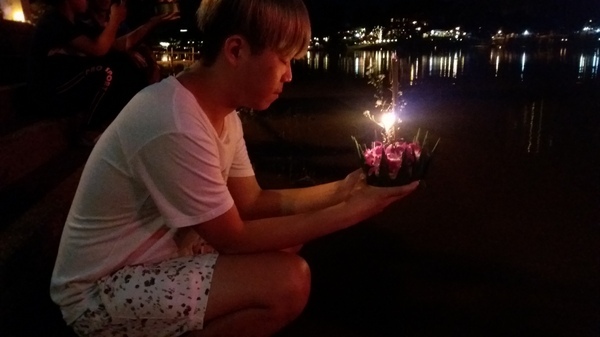 If you would like to join with All Saints people to celebrate Loi Kratong, meet at church this Friday evening at 6 p.m. We will fly lanterns and float candles together! Next Saturday, November 11th, is Remembrance Day. I, will be taking the ceremony at the Foreign Cemetery. This will begin at 10:30 a.m. Please attend if you can. The ceremony will be followed by lunch at the Gymkhana Club provided by the British Embassy. 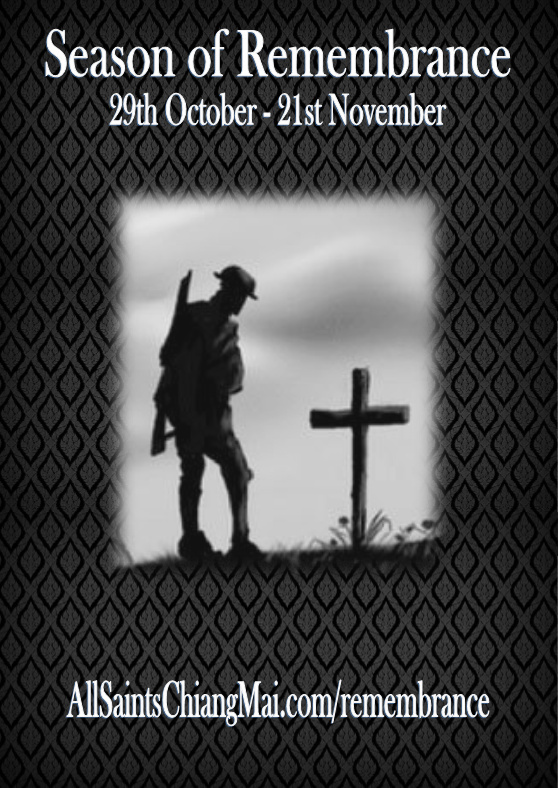 Our service next Sunday on November 12th will begin at 10:30 a.m. to allow us to mark a two minutes silence at 11 a.m.